Signal from Sector Six quite possibly adds as much to the ongoing plot as the two prior episodes, all the while leaving Kaz utterly unaware of that fact. Writer Brandon Auman does a fantastic job of bringing Poe back, showcasing the Resistance and New Republic Navy’s skill, and establishing a major plot thread and new character in Synara; all the while writing the episode as if this is just a simple Voyage of the Space Beagle plot. This is mostly owing to the fact that the episode is just a classic sci-fi - distress signal from ship that has some monster aboard - story, that merely pushes the plot forward naturally from within the context of a story that exists for its own sake. Much as I liked the previous episode, I think there is something quite skillful about episodes like this, whose plot would be just as good if it didn’t move the story forward. I don’t know if in the writing process they had this episode set up before deciding to introduce Synara here, but that is irrelevant to the fact that the episode manages to know what it is and realize its concept fully - and push the overarching plot forward adjuvantly. A substantial amount of praise needs to go to Sergio Paez’s skills as a director, and story boarder. He makes the hallway tracking shots and classic Alien-style claustrophobia still great to look at due to how amazing the animation is. Most directors can make the - monster stalking our heroes in an enclosed space - thing work, but few can make a Kowakian Monkey-Lizard scary. Getting back to the plot itself Poe returns and we get a nice chance to really dive into Poe and Kaz interacting for a prolonged period of time. 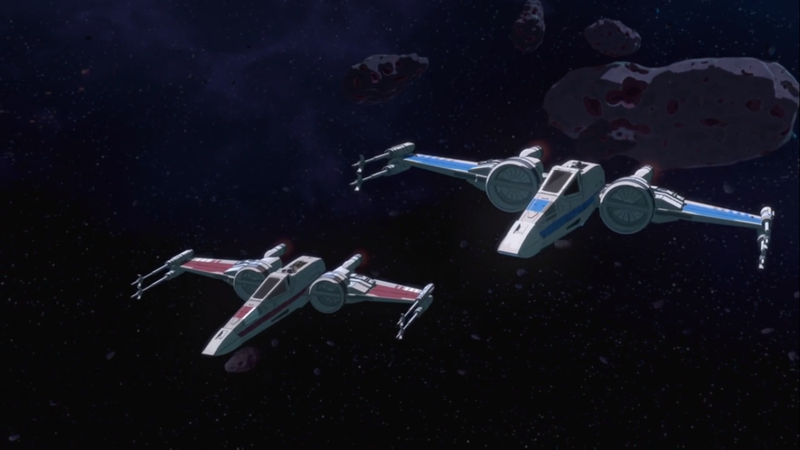 Driving home that the Resistance does more than just fight the First Order was nice, and the episode has some great tidbits for fleet junkies like myself. 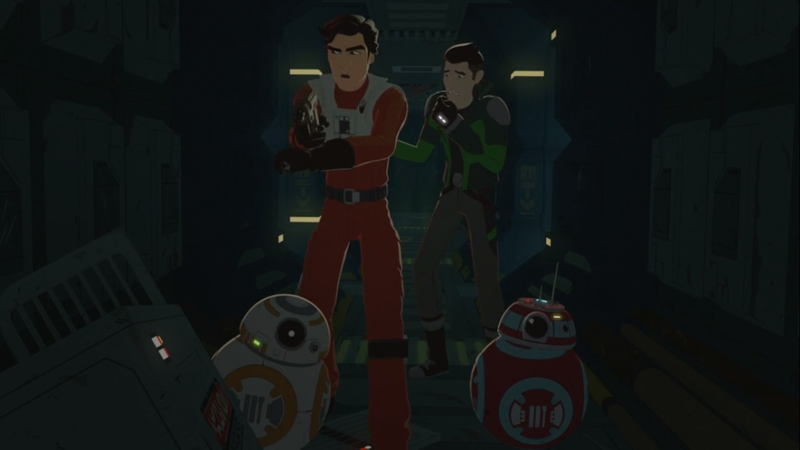 Finally getting a red T-70 was nice, and the short scene of Poe and Kaz stretching their wings and doing so tricks was exactly what I want from a show about pilots. The films make sense relying on fast-paced starfighter actions, but Resistance is able to capture the core of starfighter focused stories. The technical skill involved in being a pilot, and actually dealing with things like velocity and arching just add to the flavor of the series. Perhaps the best consequence of having Oscar back as Poe is the fact that we get to hear him deliver some rather fun lines. Poe ranting about how much he hates monkey-lizards is hysterical and all the slapstick with them really worked for me. Honestly the fact that the show managed to do a ghost ship story with monkey-lizards and both make it hysterical and legit terrifying in an absurd way, is mighty impressive. The giant monkey-lizard eating pirates and members of the crew is already dark, but Poe proceeding to say “better them than us” is the icing on the cake of morbidity. Even more disturbingly hysterical is the gag of Poe shooting into the ceiling as a warning shot……only to utterly murder a monkey-lizard. I don’t even have to explain why, Kaz and the other monkey’s expressions speak for itself. The pirates showing back up was nice, especially since it alludes to the idea that Kragan’s people are actually their own gang. They have their own business and jobs, they just do some raids for the First Order. I really hope the murderous - giant monkey-lizard comes back at some point. it is still out there and Kragan did secure the ship by the end. It is worth talking a bit about Synara. The reveal of her being one of Kragan’s people was obvious for anyone keeping track of the toy-line, however this actually did surprise a few of us, given that we thought that she was undercover as a vendor seen in Triple Dark. Here it is revealed that that must have been some other Mirialan, as Synara clearly had no way onto the Colossus legitimately prior to now. I look forward to seeing how this thread plays out, given that we not only have a spy in our midst, but a spy who, like Kaz, had no real intention of being one. There is also interesting potential in Kaz’s compassion and decency being the reason Synara now has access to the Colossus from the inside. On the whole I really enjoyed this episode. Not only did it move forward the pirate plot and establish more of a bond between Kaz and Poe, but it also gave us just a plain good episode. That is all I can really ask, sometimes simply a solid plot, and great animation/storyboarding are all you need.